Growing a business isn't about marketing just generating leads or sales closing a certain number of customers. It's about the unification of these teams and aligning the process between both to create the most efficient marketing and sales engine possible. There are a few key pieces to this puzzle. The first is marketing generating and handing off marketing qualified leads to the sales team. The next is the sales teams effectively engaging these leads. This is one of the most challenging pieces because it's the first critical junction of the marketing and sales teams on a day-to-day basis. Unfortunately, this is also where many companies fall short in their adoption of inbound marketing. Without creating a process and fostering urgency and persistence within the sales team to follow up with these leads, top and middle of the funnel marketing efforts become fruitless. Don't believe me? 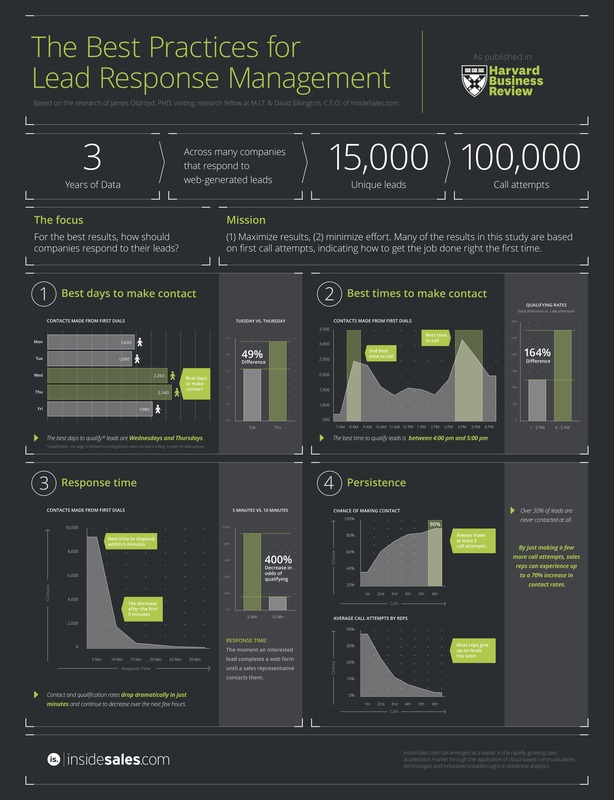 The infographic below from InsideSales.com and the Harvard Business Review clearly illustrates the stark differences in success rates and best practices for inbound lead follow up. Want to learn more about inbound sales? Check out our Guide to Inbound Sales for more best practices, tips and tricks on how to grow a high velocity inside sales team.